This has to be the nicest Lil Luis relic card we have in our collection. It's from the 2010 Topps Tribute set and is numbered to only 99. I won this off eBay last week for $3 shipped. 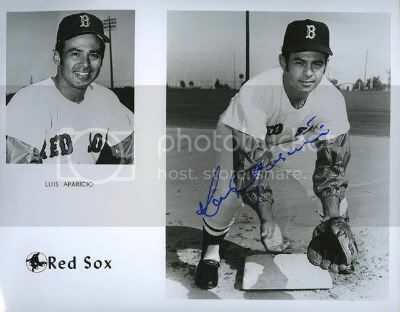 A big part of our Luis Aparicio collection are autographed 8x10 photos. I'm not sure how many different ones we have but it's quite a few. 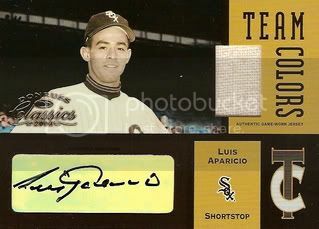 Here's another card we got from a friend on SportsGraphing.com. 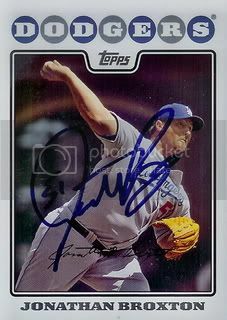 This one is of two-time All-Star, Jonathan Broxton. 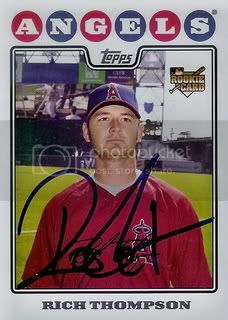 Angels reliever, Rich Thompson signed a card for our set. Rich was a member of the Australian team in the World Baseball Classic in 2006 and 2009. Thanks to a friend on SportsGraphing.com we were able to add another signed card for our set. 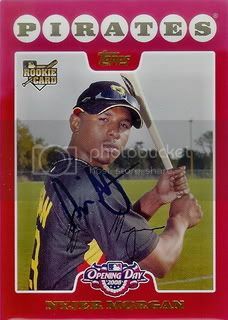 This one is of two-time All-Star Cristian Guzman. 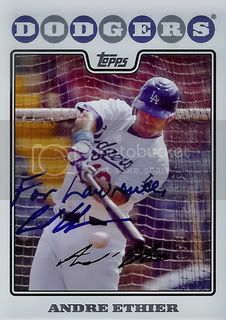 Former Los Angeles Dodgers prospect, Andy LaRoche signed a card for our set. Andy is currently on the Oakland A's. I knew he was with the A's organization but was a little surprised to see he's actually on the big league roster. He's played in 29 games so far in 2011. Got another good one back. 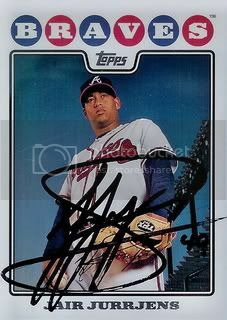 Atlanta Braves pitcher, Jair Jurrjens signed his card from Series 2 for our 08 Topps set. Thanks to eBay I was able to add another 14 card 2008 Topps team set to our collection. This one is of the Seattle Mariners. 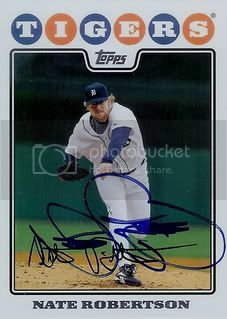 Former Tigers pitcher, Nate Robertson signed a card for our set. Nate is now with the Seattle Mariners organization. Good news! We just got our first signed card from the 2008 Topps Chicago Cubs 55 card team gift set. 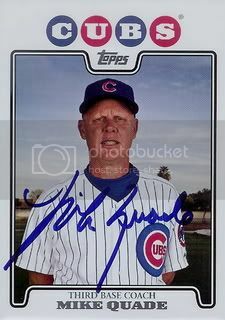 Back in 08 Mike Quade was the third base coach for the Cubbies. He is now the manager and we're proud to announce he signed a card for our collection. 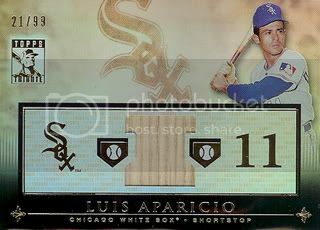 The Topps Archives Reserve sets feature some of the nicest cards ever made. 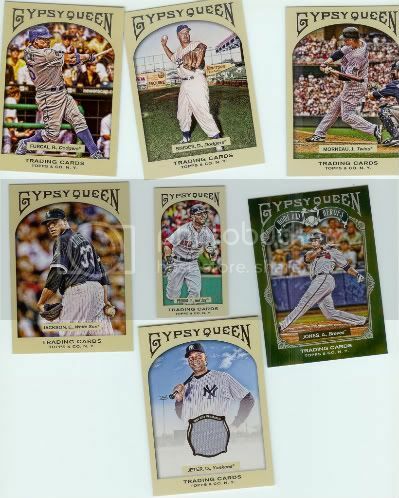 Topps took their classic designs and modernized them by turning them into REFRACTORS. How awesome is that? 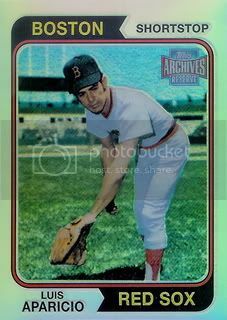 This Lil Luis is from the 2001 set and is of his original 1974 Topps card. I have a few more cards from this set of other players that I'll have to do a post for sometime. Former Arizona State star, Andre Either signed a card for our set. I actually got this one back sometime last year but it ended up in the wrong pile and never was scanned. Andre's done pretty good since he signed this card for us. I remember something about a 30 game hitting streak. This is only the second pack of Gypsy Queen I've bought and it was a good one. I'm now the proud owner of a Derek Jeter jersey card. Even though I'm not really a Yankees fan, this card is still pretty cool. The pack also included a nice Duke Snider card, a Dustin Pedroia mini, and an Andruw Jones Home Run Heroes insert. 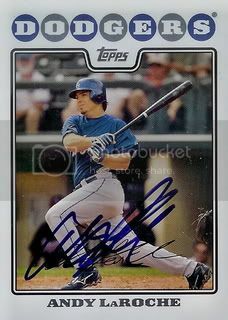 Blog reader Dan came through for us again with three more signed 08 Topps cards. 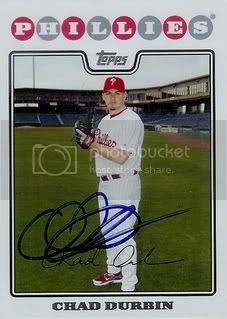 The final card Dan sent is of former Phillies reliever, Chad Durbin. Chad is with the Cleveland Indians this year. Dan got this one signed before an Indians game earlier this year. 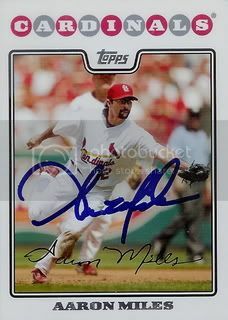 The second card Dan sent us is of former St. Louis Cardinals infielder, Aaron Miles. This one's got a nice picture and Aaron has a cool signature. I've never gotten his autograph before so this one is extra great. Dan had better luck writing to Shawn Marcum this Spring Training than I did trying to get him in person. Shawn's off to a pretty good start with the Brewers this year. It's really great to have this one in our collection. Thanks, Dan! 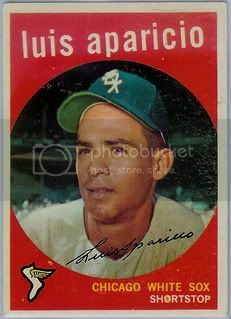 Here's the first vintage Luis Aparicio card we're posting and it's a good one. Who doesn't love the classic 1959 Topps design? This one's in pretty good shape. Nice centering, bright red coloring, and good corners. 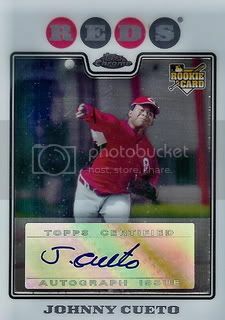 Here's another certified autograph we picked up from the 2008 Topps Chrome set. 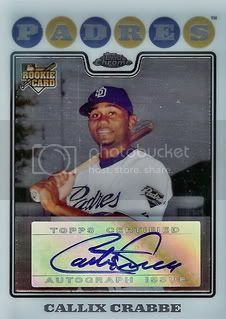 This one is of former Padres infielder, Callix Crabbe. I think we're getting close to getting all of the autos from this set. Just a few more to go. Picked this one up off eBay recently. It's a certfied autograph of Cincinnati Reds starter, Johnny Cueto. Here's a card I made of former Milwaukee Brewers prospect, Alcides Escobar. 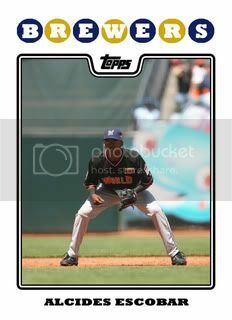 The photo is from when he played in the All-Star Futures Game in 2007. Have I mentioned that the 2011 game is in Arizona and I'll be going? I've been wanting to go to the Futures Game since it started in 1999. This year, I'll finally get the chance to go. Super cool. 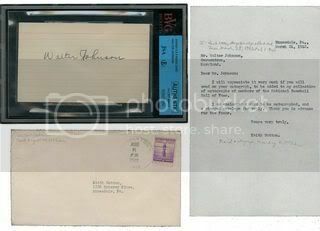 On March 14, 1942, Keith Sutton sent a letter to Walter "Big Train" Johnson requesting an autograph for his Hall of Fame collection. A few weeks later on August 10th, he received his index card back signed by arguably the best pitcher of all-time. Flash forward almost 70 years and that same index card resurfaced at SCP's recent auction. This autograph was sold in the same auction that saw a record price for Wayne Gretzky's rookie card. 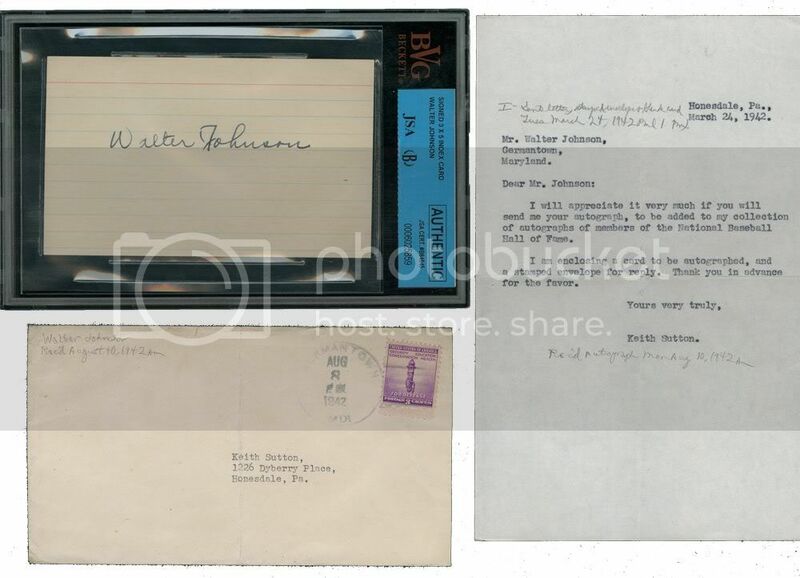 I've seen other posts on the Gretzky card this week but I thought the Walter Johnson autograph and Sutton's letter to him was much cooler. I can't imagine too many people were sending autograph requests back in the 1940s. This guy was a pioneer of autograph collecting. You can check out the details of the auction here. 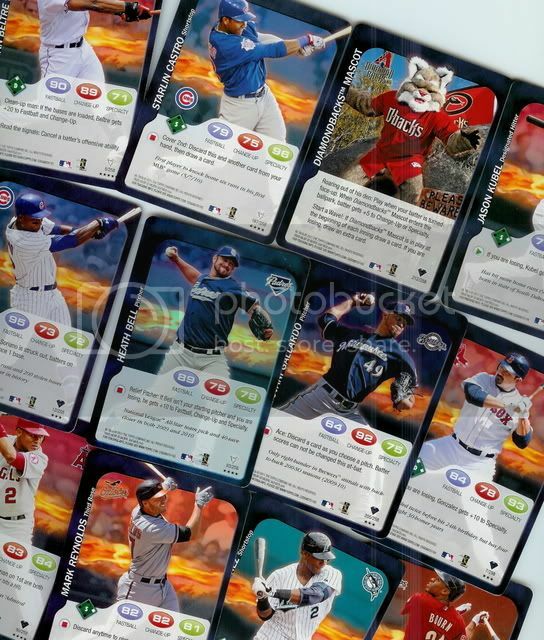 On Tuesday, A Cardboard Problem did a pack break for 2011 Topps Attax. One of the cards they got was of the Diamondbacks mascot, Baxter. Being a DBacks fan, I thought it was pretty cool. I was at my local Target today and decided to buy a pack for myself. Lucky for me, I got the one card I wanted plus a nice Starlin Castro and a foil Heath Bell. Sweet! 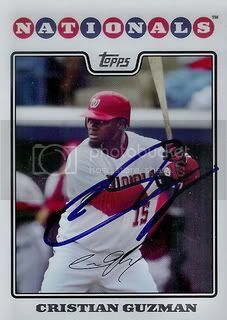 Former Pittsburgh Pirates and Washington Nationals outfielder, Nyjer Morgan signed his card from the 2008 Topps Opening Day set for us. Nyjer is now with the Milwaukee Brewers. We sent off a few TTM requests this Spring Training but didn't get a whole lot back. 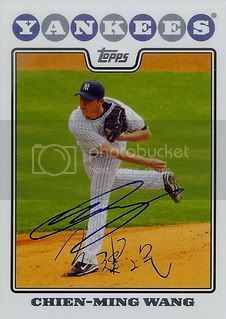 Our best return for the set was from former Yankees ace, Chien-Ming Wang. Wang hasn't pitched since 2009 due to injuries. He is currently attempting a comeback with the Washington Nationals. 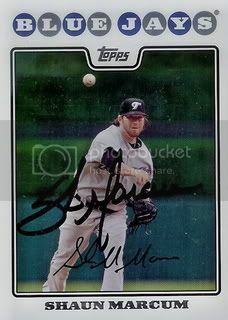 I really liked the Peak Performance Certified Autographs from the 2010 Topps set. Usually a sticker auto being added right into the middle of the card is a disaster but these are still nice. I have a dozen or so cards from this set. 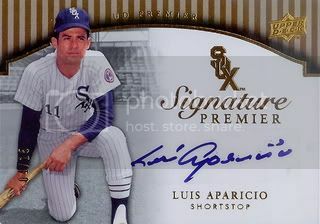 Obviously my favorite is this Luis Aparicio. These were going for quite a bit on eBay for awhile but I was finally able to snag one at a good price last December... just in time to give it to my dad for Christmas. Upper Deck scored big with another great design with their 2008 Premier set. The only draw back on this one is that it featured sticker autos. Still a great card. This is the gold version and is numbered to only 15. 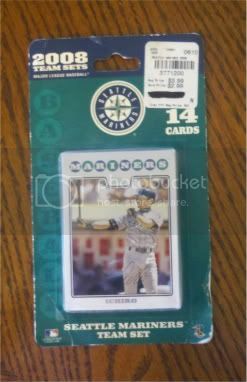 I remember when the 2004 Donruss Classics Team Colors set hit eBay. It was a pretty big deal at the time. 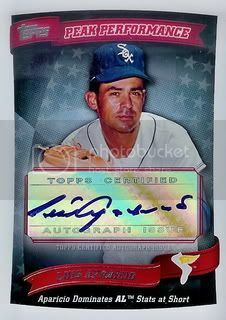 It was one of the first sets to have low numbered certified autographs & relics of retired players. Pretty simple design with a sticker auto and a decent sized piece of jersey. Not bad at all.